After you configure the On Page SEO Checker, there are four tabs to navigate your suggested ideas and track progress; Overview, Optimization Ideas, Top 10 Benchmarking and Idea Tasks. This article will walk you through the Overview tab. For help on the other tabs, follow the links in the sentence above. The Overview report displays your total number of suggested ideas, an estimation of how much traffic the ideas could help you gain, and a short table with the pages to optimize first. All seven of these facets of SEO will be able to contribute in different ways to optimize your web pages completely. Hover over each idea’s icon for an explanation of how each type of idea can help you, and click on the number to see the full list in the Optimization Ideas report. Below the ideas will be two bars comparing your "current" and "potential" traffic. This is an estimation of the potential volume of organic traffic that could come to your site if you had URLs ranking in the number 1 position for every keyword added to the campaign. 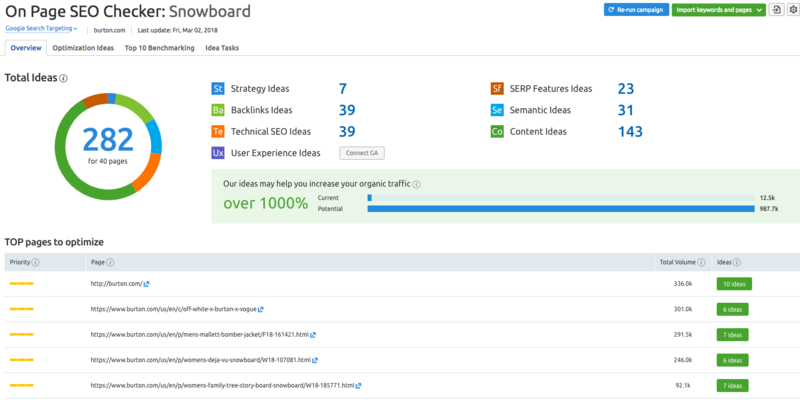 At the bottom of the Overview will be your TOP pages to optimize, listed by their priority. This priority is based on the number of ideas, the amount of potential traffic and the ease of implementation. If a page has a high number of ideas, high amount of potential traffic, and low difficulty level, it would be listed as a top priority. The pages with the highest priority are shown with three solid yellow bars, while the lower priority pages would have 1 or no yellow bars. This will be helpful if you have a campaign with a lot of landing pages and you don’t know where to focus your efforts first. The pages that are targeting the most volume of search will be at the top. To read your ideas for a specific page, click on the green button next to that landing page. To see all of your ideas, click on “view all pages and ideas.” From either of these buttons, you will open up the Optimization Ideas report. Total volume is the sum of monthly search volumes from all of the target keywords assigned to a page. For example, if one of your pages targets five keywords that each have a monthly search volume of 1,000, then the total volume for your page to optimize would be 5,000. After you’ve set up your campaign, you can always add more pages and keywords to the tool. You can import from Organic Research, Google Search Console, CSV file, Position Tracking or manually. 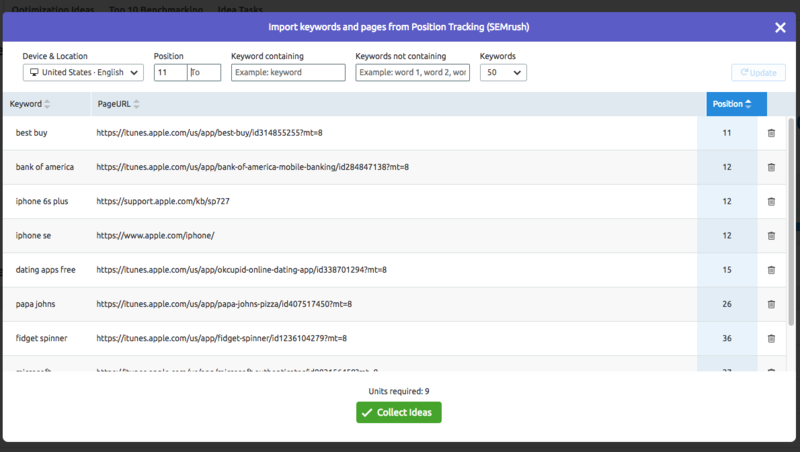 Importing through Position Tracking is a great way to import by specific device and location, position and you can filter down to include or exclude certain keywords. This, along with GSC, gives you the chance to filter your report to show only the pages ranking on the second page of Google. Generally, these pages provide a better opportunity to target. There are a number of campaign settings you can adjust with the settings gear (found at the top right of the report). You can connect your Google Analytics and Google Search Console, change the user agent of the bot, and update your scheduling preference. Please note: Although you can add new keywords from different databases on SEMrush, you cannot change the targeting of your On Page SEO Checker campaign once it's started running. This means that SEMrush will only be able to compare these new keywords to your rivals in the original location and device set up in your configuration. In order to get ideas for a different targeting than your initial settings, you'll need to start a new Project. You also have the option to change the user agent that crawls your site. If you had an issue with SEMrush Bot not being able to crawl you or your rival’s pages, then you may want to try using the user agent we label as “Google Bot”. Open the settings gear and scroll down to “User Agent.” If you change the user agent, the tool will re-crawl your website and it may even generate new ideas. If you are still running into issues, you may need to whitelist the bot. With the button beside the settings gear, you can export your ideas to an .XLS file. In your excel file you’ll see each page and target keyword listed with a priority scale based on which pages will have the biggest impact once optimized. The higher the number in the priority column, the more important it will be to improving your site's SEO. The re-run button is located in the top right corner of the report, next to the export and settings buttons. After you’ve done some SEO work, whether you published new content, built new backlinks, or fixed technical issues, you should re-run your On Page SEO Checker campaign to keep everything up to date. The user agent will re-crawl you and your rivals’ pages and generate an updated list of ideas based on your current content and rankings. You could see an increase in ideas if there was a long amount of time between the last time you ran your campaign and your landing pages lost positioning. If your landing pages are improving and you are implementing the ideas, you could see a decrease in ideas suggested by SEMrush when you re-run the campaign. To follow changes of your campaign over time, use the Idea Tasks report.